*I received free samples of Sabra Hummus mentioned in this Mediterranean Egg Salad Bites post. By posting this recipe, I am entering a recipe contest sponsored by Sabra and I am eligible to win prizes associated with the contest. I was not compensated for my time. It’s been a while since I’ve posted an appetizer on the blog. Now that the weather is warming up, I’m looking forward to summer parties with friends and neighbors. Time for more tasty bite-sized recipes! I love having yummy finger foods around when I entertain at home. It’s an awesome bonus if they are healthy, too. If you follow me on Instagram, you’ll already know that I’m a huge fan of Sabra Hummus. When The Recipe Redux posted this recipe contest featuring this plant-based protein product I couldn’t wait to test out some new creations. Playing with food is the best job ever. Also, did you know that May 13th is National Hummus Day?! I love a reason to celebrate food! I really could eat this stuff straight out of the container with a big ol’ spoon! One of my favorite healthy snacks are these Hummus Stuffed Egg Whites. Not only are they super tasty, but packed with great protein and fiber. It’s one of my afternoon go-to snacks. That snack favorite was the inspiration for these flavorful loaded Mediterranean Egg Salad Bites. This appetizer is simple to make, loaded with nutrients and full of muscle-building protein and fiber. I think they taste pretty amazing, too. If you’ve never tried raw zucchini, you should give it a go! I love it raw with toppings and spiralized for salads. This raw Zucchini Salad recipe is one of my summer go-to side dishes. I love it with grilled steak or chicken. I’ve been stressing out about getting this post done on time. Over the weekend I spilled a cup of herbal tea on my Mac. I know. OMG. It was completely counterproductive of my efforts of trying to relax with a lovely warm cup of chamomile. Needless to say, some bombs were dropped as I rushed to try and flip it over and dry it out. After two days of drying, my Mac still wouldn’t boot-up. I new that I needed to get it fixed or replaced. I had to borrow my husband’s computer without my photo editing software and handy blog tools to get back to work. The photos in this post might need some tweaking when I get my computer back. I’m just glad that I could get this blog post finally finished and make the contest deadline! Thanks to a friend of mine, I found a local computer repairman to replace the parts that I fried with the spill. Note to self: Never. Ever. Ever. drink liquids near my computer again. Lesson learned! I’m too clumsy to be trusted with liquids near expensive things. End of story. Now back to tasty food…and these light and tasty Mediterranean Egg Salad Bites. Stir hummus, Greek yogurt, lemon juice, oregano, salt and cayenne together in a small bowl. Peel and chop hardboiled eggs and add to hummus mixture. Add roasted peppers, capers, olives and 2 tbsp red onion and mix to combine. Garnish with remaining finely chopped red onion. 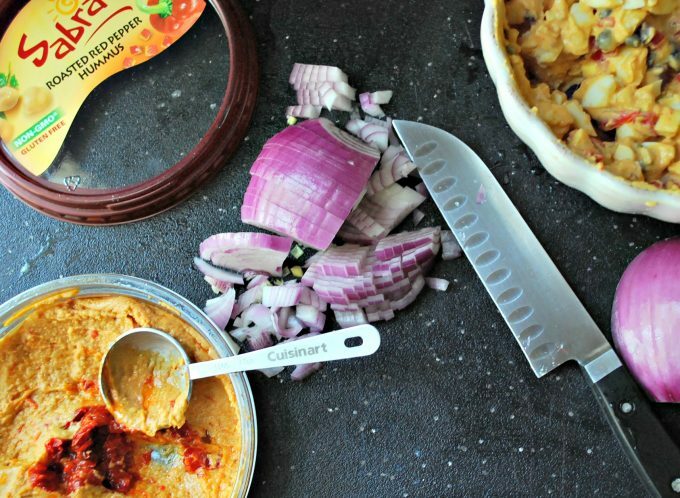 Don’t miss all of the other creative Sabra-inspired recipes from my Recipe Redux friends below! Click the link to be directed to the recipe round-up. Enjoy! OK these are adorable and so creative! Thank you so much Deanna! I love egg salad! !